The Southern Newfoundland Club have submitted the following criteria for Judges to the Kennel Club and received approval. A current list (January 2019) of judges on the SNC lists can be downloaded here. The Judges list is maintained by our Acting Hon. Secretary, Jeni Giambona so please contact Jeni by email with updates to your judging CVs, changes of address or telephone number. Jeni is also the person to contact to regarding inclusion on the SNC Judges List - the SNC's questionnaire/application form can be downloaded here. For persons who have previously been approved by The Kennel Club to award CC's in the breed and have completed their first appointment. To have the support of The Club. For persons who fulfil all the requirements for the A3 list and who have been assessed in accordance with Kennel Club requirements and accepted by The Kennel Club for inclusion on an A2 list and have the support of The Club. Minimum of 7 years judging experience in the breed and have the support of The Club. 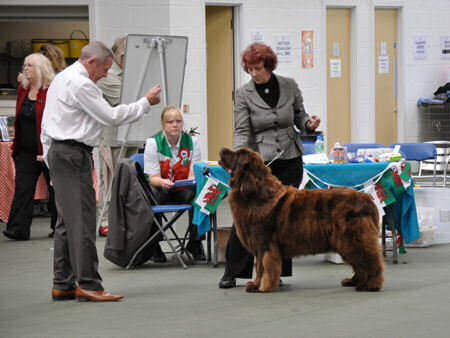 To have judged at three (3) Breed Club Supported Entry Shows. To have judged the breed at eighteen (18) Open Shows or Championship Shows without CC's with an adequate geographical spread. To have judged a minimum of 50 classes. To have judged a minimum of 110 dogs of the breed. To have attended a Conformation & Movement "Hands on Assessment" conducted by a Kennel Club Accredited Trainer and passed the assessment. To have bred and/or owned a minimum of three (3) dogs when they obtained their first entry in The Kennel Club Stud Book. Minimum of 7 years judging experience in any one breed (to include 5 years in this breed) and have the support of The Club. To have awarded CC's in at least one other breed. To have attended at least one breed specific judging seminar run in accordance with the relevant Kennel Club Code of Best Practice and passed an examination and/or assessment where applicable. To have bred and/or owned a minimum of 3 dogs of any breed when they obtained their first entry in the Kennel Club Stud Book. To have stewarded at twelve (12) shows. To have 5 years experience owning and exhibiting in this breed and have the support of The Club. To have judged 15 classes of this breed at Open Shows or Championship without CC's. To have judged 30 dogs of this breed. To have attended at least one Breed Specific Seminar and passed an assessment where applicable. Minimum of 5 years judging experience in any one breed and have the support of The Club. To have judged 15 classes of this breed at Open Shows or Championship Shows without CC's. To have attended at least one Breed Specific judging seminar and passed an assessment where applicable. For aspirant judges who have shown an interest in the breed and have the support of The Club.